Elle didn't plan on falling for anyone on this singles' holiday so it came as a huge surprise to her when she fell, hard, for her very own Italian stallion. But it seems he's not as perfect as he first appeared - especially now that his maybe-not-so-ex ex-girlfriend has turned up. Elle doesn't want to believe that it was all a lie but it's hard to ignore the very real bombshell standing in front of her. Has she been taken for a fool? As the end of the holiday approaches, confusion and heartbreak threaten to ruin Elle's hard-fought peace of mind. Does Tuscany have enough magic left to fix her broken heart? You Had Me at Merlot was published in four parts during July and August 2014. You had me at Merlot: Part 4 begins where Part 3 left us. When Elle arrived at Bella Notte she didn't plan on falling for anyone on his single's holiday, especially not for the owner son, Jamie. All seems too perfect until unexpectly Jamie's ex-girlfriend turned up. Now, everythings seems like have been a big fat lie. Not much time is left until Elle and her friend Laurie have to go back to England. Will she leave heart broken or will her heart be fixed? All good things come to an end. Unfortunately also You Had Me at Merlot too. This was my favourite part of the whole series. I'll truly miss the characters. Overall it was a brilliant series. It is a really fun and refreshing read, a novel filled with humour and a sprinkling of romance. The writing is easy to follow and flows well throughout leaving you eager to find out what could possibly comes next. Lisa Dickenson magages to draw you in the story so quickly which makes it so easy to connect to the characters. The most amazing thing is Elle's and Laurie's wonderful bond of friendship. I'm very happy I've been introduced to Lisa Dickenson and her writing through the book blogging community. She is a brilliant writer with so much talent. 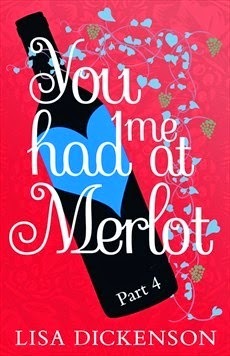 If you need a book thats cracks you up laughing out loud, You Had Me at Merlot is your choice. I'm looking forward reading more of her in the future.